Apollo Career Center student Lucas Perkins welds pipes during a class at the Apollo Career Center. LIMA — Welding jobs are currently in high demand and are an ideal industry for high school graduates looking to live debt free and earn above-average wages, according to Doug Durliat, West Central Ohio Manufacturing Consortium Director. An entry-level welder can start off earning an hourly wage in the mid-teens without a college degree, according to Durliat. 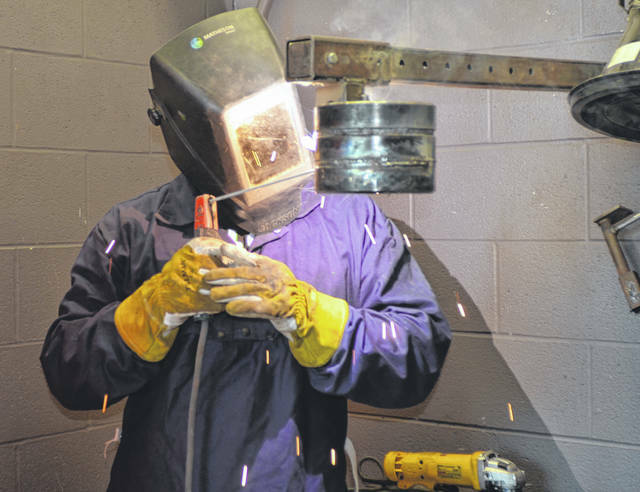 In the Lima region, students can complete welding programs at career centers like Apollo Career Center in Lima, Rhodes State College and Vantage Career Center in Van Wert. Starting as early as 15, teenagers can learn the fundamentals of welding and receive certifications to work in the welding industry through programs like the Youth Welding Boot Camp at Rhodes State College. Each Saturday from July 28 to Aug. 25, students between the ages of 15 and 18 will learn different aspects of welding including Shield Metal Arc Welding (SMAW), Gas Metal Arc Welding (GMAW) and Gas Tungsten Arc Welding (GTAW). Students will also gain knowledge about the inspection of welding and the quality acceptance criteria. They will be assessed based on their competency and performance and their work will not be compared to other students. To register and find more information about the camp, visit the Youth Welding Boot Camp EventBrite Page or call Rhodes State College between 8:30 a.m. and 4:30 p.m. at 419-995-8351. The Ohio Development Services Agency, the Youth Welding Boot Camp partner, believes that this camp will be beneficial for teens like looking to enter the welding industry. Students who are looking to further hone their welding skills or high school graduates who are looking to get started in the industry can earn basic, intermediate and advanced certifications through the West Central Ohio Manufacturing Consortium. Through the basic certification, students can learn the basics of the manufacturing industry. The intermediate certification provides students with hands-on manufacturing experience with CNC Machining, Electrical, Process Operating, and students who wish to earn an associate’s or bachelor’s degree in a manufacturing field can complete the advanced certification. Apollo Career Center is another educational center where students can earn a five-month welding certificate, complete the 11-month Fabrication Concepts and Plate welding program or the 12-month Structural Plate and Pipe Welding program. Students who earn the five month certificate will be proficient in MIG welding, the most common type of welding, according to Ann Benfield. The 11 and 12-month programs will offer more welding knowledge about Gas Metal Arc Welding, Gas Tungsten Arc Welding and more. Apollo also offers a testing facility through the American Welding Society for students from other schools. Steve Elshoff is one the many Apollo students currently in a welding program, and he is excited about starting his career. He expects to graduate by next June and is very grateful for this experience thus far at Apollo. Students who are certified through these various career centers can land jobs at companies like Honda of America in Anna, which is currently hiring for an Entry Level Materials/Welding Engineer, and Staffmark, which is hiring for a Robotic Welding Operator, according to the OhioMeansJobs website. General Dynamics, a global aerospace and defense company in Lima, also has plans to hire welders onto their team in the near future, according to Durliat. https://www.limaohio.com/wp-content/uploads/sites/54/2018/07/web1_welding-1.jpgApollo Career Center student Lucas Perkins welds pipes during a class at the Apollo Career Center.